Prevent and manage wounds with this expert, all-inclusive resource! 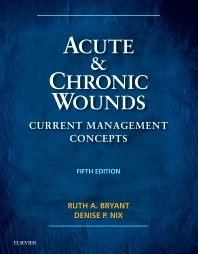 Acute & Chronic Wounds: Current Management Concepts, 5th Edition provides the latest diagnostic and treatment guidelines to help you provide quality care for patients with wounds. This textbook presents an interprofessional approach to maintaining skin integrity and managing the numerous types of skin damage including topics that range from the physiology of wound healing, general principles of wound management, vulnerable patient populations, management of percutaneous tubes, and specific care instructions to program development. Written by respected nursing educators Ruth Bryant and Denise Nix, this bestselling reference also provides excellent preparation for all wound certification exams. A comprehensive approach to the care of patients with acute and chronic wounds guides students and health care providers to design, deliver and evaluate quality skin and wound care in a systematic fashion; the comprehensive approach includes the latest advances in diagnosis, differentiation of wound types, nutrition, prevention, treatment, and pharmacology. Self-assessment questions and answers in each chapter help you assess your knowledge and prepare for all wound certification exams. Checklists offer a concise, easy-to-read summary of the steps needed to achieve the best patient care outcomes. Risk assessment scales help in determining a patient's risk for developing a wound, and wound classification tools identify the proper terminology to be used in documentation. Learning objectives at the beginning of each chapter focus your study on the most important content. Principles for practice development boost outcomes and productivity in agencies and institutions, home care, acute care, long-term care, and long-term acute care settings.